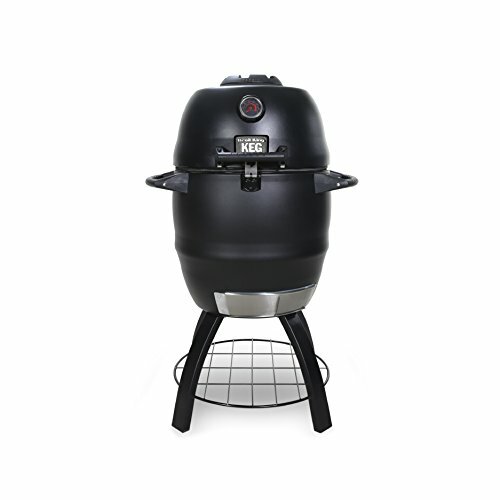 Kamado grills are growing in popularity due to their temperature versatility and unique design. They are perfect for both high-heat grilling and low-n-slow smoking, and they make a statement in any backyard. Additionally, these hardy little units are known for outlasting other types of grills and smokers. With so many on the market today, choosing the best Kamado grill to suit your needs requires a little research – lucky for you, we’ve done just that! What Exactly is a Kamado Grill? Our number one pick is the Kamado Joe Classic II. It is the heaviest grill on our list by a fairly large margin, providing superior durability and insulation. 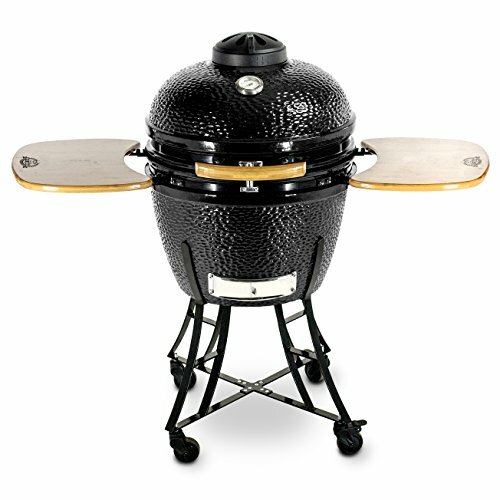 The steel body of the Char-Griller Akorn Kamado Kooker gives its a modern look; its triple-walled construction ensures that it provides the same benefits as traditional kamados. The Broil King Keg 5000 is another steel model that’s larger, heavier, and provides more cooking area than the Char-Griller. 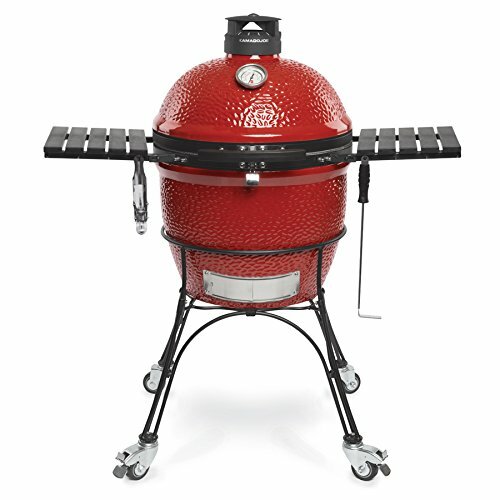 The Pit Boss Kamado BBQ is a traditional ceramic design that provides an impressive 567 square inches of cooking area. It’s similar to our top pick, but weighs ~70 pounds less. 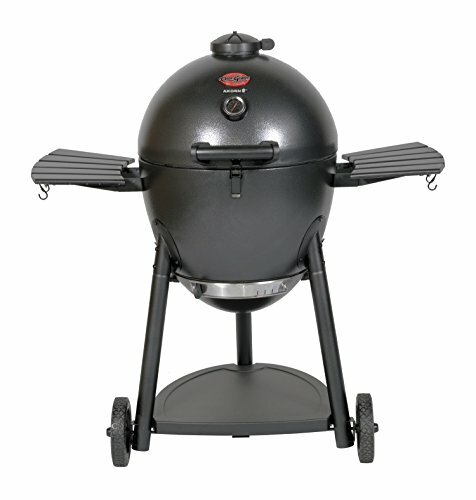 Lightweight and compact, the Char-Griller Akorn Jr. Kamado Kooker is the perfect Kamado grill for use on the go. The word ‘Kamado’ translates from Japanese to English as ‘cooking range’ or ‘stove’, and is somewhat of a blanket name for this kind of grill or smoker. Available in a range of shapes, sizes, and colors, the Kamado grill is specifically designed to be fuel efficient and offer versatility when it comes to cooking. No gas or electricity needed, these grills only use wood or charcoal for fuel. The construction is simple but effective – largely crafted from heavy duty refractory ceramic materials which have been designed for durability and superior insulation, the Kamado grill utilizes air flow and heat retention to channel even cooking and a huge range of temperatures. Whether you want to smoke low and slow, bake a loaf of bread, or sear over high heat, these grills can accommodate your needs. Superior heat retention ability increases fuel efficiency. Extremely versatile – can be used to roast, bake, grill, smoke, and can behave much like a wood-fired oven. Able to withstand a huge range of cooking and grilling temperatures. Air flow and, consequently, temperature can be carefully and precisely maintained for accurate cooking in spite of external conditions like wind and freezing temps. Easy to clean and take care of due to simple design. 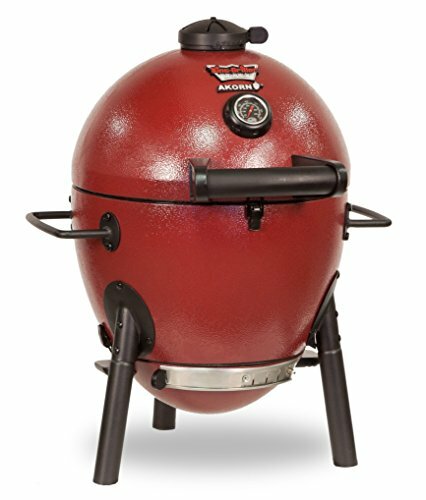 Traditionally, Kamado grills are constructed from terracotta, making them fantastically well-insulated – and heavy! Modern designs can be crafted from high fire ceramics, Portland cement and crushed lava, insulated steel, and refractory materials. Newer construction materials make modern Kamado grills very durable and less likely to crack, a fault in the more traditionally-crafted models. Make sure that the grill you choose offers a double wall or thickness to the construction of the pit, not only to improve product longevity but also to make sure of fuel efficiency and proper heat distribution. Grills built with thinner, lesser-quality materials may have trouble maintaining temperatures should the weather be cold or windy and are more likely to develop weaknesses with continued use. Make sure the dampers and lid seal well and are easy to maneuver. Dampers need to slide open and shut cleanly and accurately and the lid must form a tight seal on closing – this allows for improved heat retention and even greater fuel efficiency. Should dampers and lid not shut tightly, temperature monitoring can become less accurate and the amount of fuel expended per use rises. Due to the tightness of the seals, it should be noted that Kamado grills can produce “flashovers,” which are essentially fireballs that shoot from the pit when the lid is lifted. This happens when the coals are starved of oxygen and the lid of the grill is opened, allowing oxygen to flood in and ignite the coals. Given the density of the pit walls, it should come as no surprise that some of these Kamado grills are incredibly heavy. While some do come equipped with wheels to aid movement, some stand-alone models do not. Consider the mobility you will need for your grill – does it need to be put into storage if you have a small outdoor area? Is it going out on a deck in an apartment building with no elevator? Will you be able to maneuver the grill alone or will you need help? Kamado grills are purely for wood and charcoal burning, not for gas or electricity (although there are some models on the market which have been adapted). Purists will insist on using hardwood lump charcoal, which produces very little waste (easy clean up and does not restrict air flow) and can be manufactured in an environmentally-friendly way. Lump wood charcoal also contains no additives, unlike briquettes for example, which can alter the flavor of the food. Hardwoods and charcoal can also be used and there is a huge variety to choose from, depending on your personal preference. If you want to go the more traditional route and use lump wood charcoal, note that it is more expensive than other fuels, but the fuel economy of the Kamado helps to offset that. Also note that chemical starters and lighter fluid should never be used to start a fire in the pit, as the chemicals can leach into the porous interior, causing damage to the grill, and can affect the flavor of the food. Our number one spot has to go to the Classic II from Kamado Joe. All-round excellent, this grill incorporates everything you need to achieve the perfect result every time. From the four wheels on the cast iron cart to aid with mobility to the patented slide-out ash drawer, designed to make clean up a breeze, the Classic II has all the fine details nailed. Divide and Conquer, their patented cooking system, offers you the ability to cook different foods in different ways at the same time. With 256 square inches of cook space as standard, this total area can be expanded up to 660 square inches with the addition of grates and grill expanders. The thick-walled ceramic shell ensures that heat is retained and evenly distributed, while the six-piece Advanced Multi-Panel Firebox helps prevent breakage, maintaining durability for years to come. Featuring a stainless steel latch and wire mesh fiberglass gasket, the seals are air-tight and extremely durable for your peace of mind. The air lift hinge is an incredible feature – many Kamado grills have a hinge that lets the lid fall when opened or closed, but the Classic II uses a clever design to reduce the lid weight by 96%, letting you lift it with a finger and stopping it wherever you need. With the addition of the Kontrol Top Tower, a weather- and rust-proof vent, air flow can be monitored accurately. The easy-to-read built-in thermometer allows you to precisely control temperatures at a glance. Also note that Kamado Joe has their own YouTube channel with tips and recipes. Aiming to be durable but lighter and more accessible than traditional Kamado-style grills, the Akorn from Char-Griller brings the cooking versatility you want with more modern construction. Crafted from 22 gauge steel, porcelain-coated inside, the pit itself is triple walled to ensure high heat retention and accurate temperature maintenance from 200-700°F. The three wheels aid with mobility, with one locking caster to enable stability during use. With the main grill area at 314 square inches, the addition of a removable warming rack brings total grilling space to an impressive 447 square inches, making it spacious enough to accommodate your favorite cuts and sides. The two adjustable dampers make setting and adjusting air flow to achieve the right temperature easy, with the bottom damper being numbered so you can make a note of its position. The inclusion of a temperature gauge mounted into the lid allows for quick and easy monitoring and adjusting of internal temps. Clean up is also made simple with the addition of an ash dump pan, saving you from having to vacuum waste ash from the pit. This model also includes two side shelves with tool hooks which fold away when in storage or not being used. Weighing just 126 lbs, the Keg 5000 from Broil King is almost the lightest Kamado-style grill on our list, making it one of the most portable too. Designed with that in mind, this grill is constructed from insulated steel to retain heat without increasing weight. Two side shelves are easily removed and the wheeled base can be adapted for a trailer hitch, making it the perfect grill for camping and tailgating. A multi-tool is included with this model to aid modifications for transportation. Not compromising on space, the primary and secondary grill spaces combined offer a whopping 480 square inches. The main grilling area is crafted from heavy-duty reversible cast iron, with the secondary area made from chrome-plated steel which moves to the side, rotating for easy access to all of your food. Both dampers on the Keg 5000 are numbered so that you can make a note of their positions, easily adjustable to create the perfect air flow and maintain cooking temperature. Known as the Root-Draft system, the precise airflow it offers means this grill is ideal for both low and slow cooking as well as high temperature searing and grilling. The addition of a pull-out ash tray makes cleaning the pit and discarding waste much easier. With one of the largest grilling areas on our list, the Pit Boss Kamado BBQ provides you with 573 square inches over two levels, ensuring enough space for everything you want to cook. On the heavier side at just over 218 pounds when assembled, this model offers some mobility with four heavy-duty swivel canisters and wheels, two of which are equipped with locking mechanisms for stability when in use or in storage. Wanting to ensure fluid motion when opening and closing the lid, the K22 utilizes a strong wooden handle and springs, allowing the lid to be lifted and held in place with ease. The fireproof felt edge and shock absorbers help prevent the lid from slamming shut and also provide a secure seal, maintaining accurate internal temperatures. The hardware is all stainless steel, making it durable and rust-proof should the grill be exposed to the elements. The easy-read thermometer, installed in the lid, allows you to quickly see the temperature. Located next to the cast iron calibrated damper, you are able to easily adjust cooking temperatures with a small tweak of the air flow. This model features two bamboo side tables, ideal for holding plates and cooking tools, and which can easily be folded away for storage when not in use. All the benefits of the full-size Akorn grill in a much smaller package – the Akorn Jr. weighs in at a positively tiny 37 lbs, making it extremely portable and easy to travel with. The primary cooking area is smaller than others, at 157 square inches, with a cast iron grill to ensure even cooking at low and slow temperatures or high grilling and searing temps. Constructed from 22 gauge steel and triple walled, the pit itself is able to handle a huge range of temperatures – from 200°F all the way to 700°F, making it a versatile cooking option. Like its big brother, heat is controlled with two dampers – one on the lid and one at the bottom, each easily adjustable for precise and carefully maintained air flow and temperature. The bottom of the Akorn Jnr. is removable, allowing for easy ash disposal and quick clean up on the go. For ease of movement, this model from Char-Griller has two heavy-duty handles, one on each side of the pit, and a locking lid. The legs of the Akorn Jnr. are short and sturdy, enabling stability when in use, but are without wheels so the unit must be lifted when moved. From their appearance to versatility, kamado grills are pretty darn neat. They allow you to cook at any temperature you could possibly want. Perhaps the only drawback is their weight, and that’s why we’ve included a couple steel models, as well as the tiny Akorn Jr. I hope you’ll find one that fits your home! Whether you’re an experienced kamado griller or new to the craft, please feel free to leave a comment or question below!